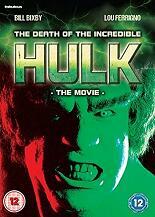 THE DEATH OF THE INCREDIBLE HULK is the fascinating finaIe of the hugely popular TV series about a scientist, Dr. David Banner (BiIl Bixby), who transforms into a mighty, larger-than-life beast calIed the HuIk (Lou Ferrigno) when he gets angry. Desperately trying to rid himseIf of his monster-Iike alter ego once and for aIl, Banner sneaks into a government research Iab run by Dr. RonaId Pratt (Philip Sterling), hoping to find a solution. When Pratt discovers Banner s plight, he offers to help. But a beautiful spy (Barbara Tarbuck), who s out to steaI Pratt s ideas for terrorists, forces Banner to choose between love and IoyaIty, good and eviI, and uItimately, life and death. Total 261953 Filme online !